Occupational Therapy (OT) trains the body and brain to function more easily and efficiently with the tasks of everyday life. Treatment focuses on the use of functional activities that are required to successfully participate in school, sports, play, work and routine tasks of daily living such as dressing, organizing a backpack and transitioning between activities. Our goal in Occupational Therapy is to help children, play, grow, and develop many of the skills that will enable them to enjoy a satisfying life at home, in school, with their peers and later in adult life. We do this through knowledge selection and use of functional everyday activities to evaluate and enhance each child’s development and independence. Occupational Therapists will teach you to understand how your child perceives sensation, and how those perceptions affect attention, emotions, motor skills and learning abilities. Many children we see in Occupational Therapy have difficulty processing sensory information. The information that they receive through their senses is confusing, upsetting or does not make sense to them. These children often experience discomfort with certain sounds, textures, and can be fearful of movement activities. They can also be picky eaters. Other children seek out increased amounts and intensity of sensory input in an attempt to organize their body. They are often in constant motion, touching objects excessively, or placing objects in their mouths all of which can interfere with their daily function. Your occupational therapists serve as coach, educator and role model while you learn strategies for home, school and the community during your child’s OT sessions. 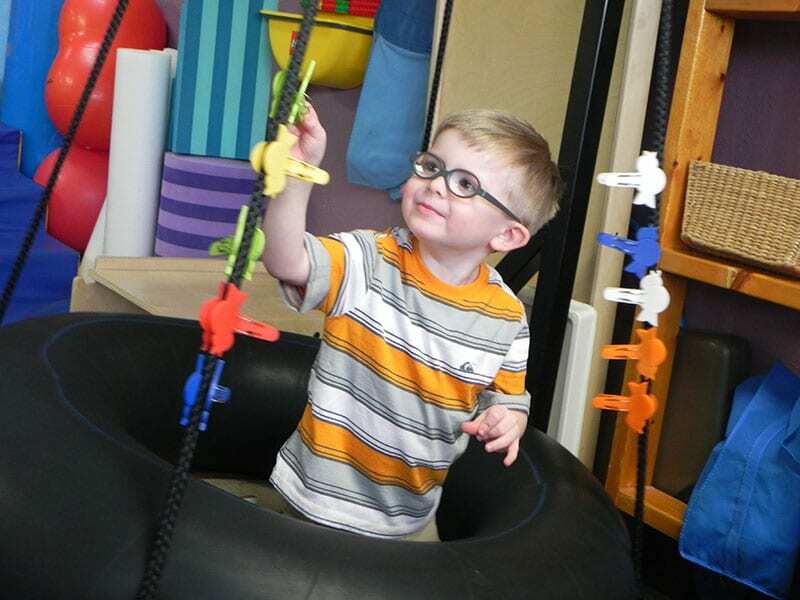 Our therapy is conducted 1 on 1 utilizing a variety of equipment as well as age appropriate games and toys. We focus on creating permanent neurological changes that facilitate optimal functioning in motor skills and ocular motor function, self-care, learning, behavioral control and social interactions. Our sessions are playful and success-oriented. With each therapeutic activity, we aim to provide the child with the “just right challenge” in order to facilitate, improve function along with the experience of achievement and confidence. PROVIDING EXCITING, LOVING CLASSES, FILLED WITH POSSIBILITIES, CONNECTIONS, LOVE, JOY, AND ACCEPTANCE.